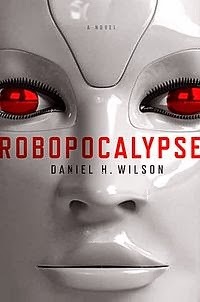 I don't normally post reviews on my blog, but I have to post a review for Robocalypse by Daniel H Wilson. I loved it. It's the best book I've read since The Hunger Games trilogy. Once I turned that first page I couldn't put it down. The story starts at the end of the robot wars when the narrating character, Cormac Wallace, locates what is considered to be the "black box" of the war. He switches on the black box and the stories of the initial incidents and fights with the robots is played back to him and he feels that he has to write all this down. "Memories fade but words hang around forever," is what Cormac states when he switches on the black box. The book flicks between characters with each chapter featuring an opening narration by Cormac. It didn't bother me at all that I got inside the minds of multiple characters. I enjoyed it actually, and I liked some characters better than others. The author does a fabulous job of giving each character a unique voice. My favourite character is Takeo Noumra. He is an elderly Japanese repairman in a factory with autism who also happens to have a relationship with an android. It is his "love" for robots that sees him override the corrupt transmissions the robots are receiving from the rogue artificial intelligence known as Archos who is responsible for the war. The way Takeo helps the robots attain freedom is beautifully human. "It is not enough to live together in peace, with one race on its knees." Archos. This quote sums up why the A.I. did what he did, and when you start to see the new world he is creating you almost wish the robots would win. Almost. I give Robocalypse 5 out of 5.